A few years ago I saw this quilt kit on one of the FB destaching sites. Its called A Graceful Baltimore by A Graceful Stitch designed by Denise Sheehan. It caught my eye so I paid $75.00 for it. Well to my surprise when it came it was a BOM and each part was had a label on it that said $25.00. Then I quickly figured it out and WHO HOO the savings. I started it shortly after receiving it and it sat in the evergrowing UFO pile. This year I figured I’m going to get rid of that pile and I got it finished. I’m not a big fan of applique but I trudged my way thru it. I did find that I like the blanket stitch way better than the satin stitch it does not make my fabric pucker. 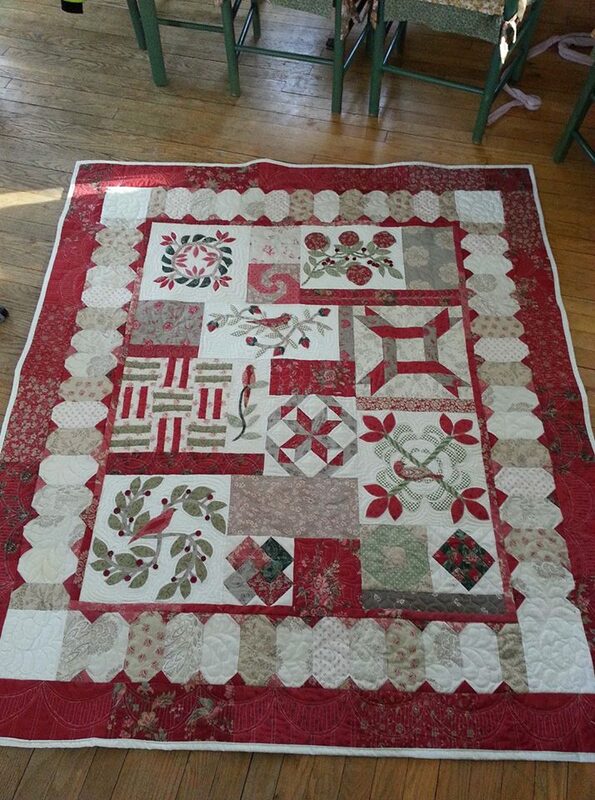 For this quilt the blanket stich gives it that old fashioned look. I looked at it over all and noticed that there are no 2 blocks identical so that is how I decided to quilt it. When I started to quilt it on my domestic machine. I do all my quilting on a Pfaff Expresion. The 1st applique block the bird on the twig I stippled. I soon realized that was going to take way too much time to do all of them this way so I started out echoing all the appliqued blocks. Then I started to do the piecing blocks. The blocks that had solid fabric I tried to give them some texture by using different quilting techniques to make them pop. This is what the back looks like out in the sun. I really enjoyed quiting this one… I think it took me about 30 hours in total to quilt it. You did an amazing job with this quilt. It’s beautiful!! Thanks. it was fun to do. sky’s the limit from here on out. Renee, this quilt is absolutely gorgeous, I am not a fan of Baltimore this one is just enough of a variation that I love it!!! It is a keeper so I hope you plan to keep it for yourself, I’m enjoying your site, Sue. Thanks Sue. ill swing over one day with it. so you can see it in person.